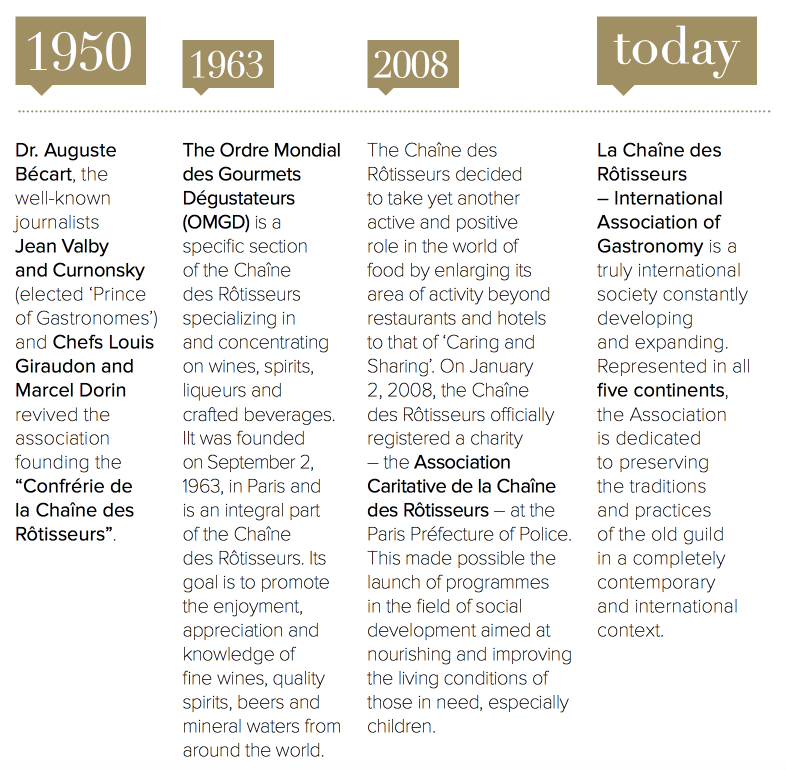 Today La Chaîne des Rôtisseurs is the oldest and largest gastronomic organization in the world. More than 80,000 persons participate annually in its activities throughout the world with 7,000 members in the USA. Bailliages (Chapters) in more than 110 countries coordinate their programs through La Chaîne’s international headquarters in Paris. In the United States, La Chaîne has approximately 140 local chapters. The National office is located in New York City. Underlying La Chaîne’s growth is the organization’s sense of purpose. A key criterion which distinguishes La Chaîne from other organizations involved in wine or food is the interrelation between amateur and professional. In La Chaîne we strive for balanced membership representing professionals involved in food preparation, service in hotels, private clubs and restaurants; wine, food and equipment suppliers and world- renowned lecturers, writers and critics, as well as knowledgeable laymen who, due to their interest in learning and/or well traveled backgrounds, are in a position to enjoy the pleasures engendered by good cuisine, good wine and good company. A global community whose focus is brotherhood, friendship, camaraderie and sharing a passion for the culinary arts. 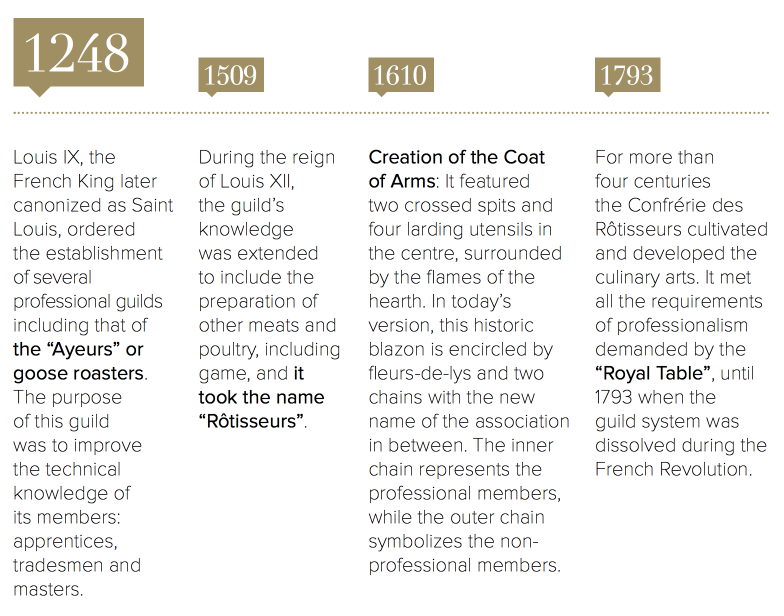 It was in the year 1248, under Saint Louis, King of France, that the Guild of Rôtisseurs was formed. Originally limited to roasters of geese (“Ayeurs”), the Guild expanded in scope and in numbers, and in 1610 it received the present coat of arms by royal warrant. (Note the crossed broches, or turning spits, on this seal. A symbolic broche is used during the Chaîne’s induction ceremony for new members and elevation in rank of deserving members). One of the most prosperous of the Guilds, La Chaîne comprised many members who were attached to the noblest of families of France. This proved less advantageous during the French Revolution, for along with most other Guilds, La Chaîne suffered significant loss of membership and was dissolved. Gastronomically speaking, 160 uneventful years passed until the revival of La Chaîne in 1950. Following recovery from World War II, three gastronomes and two professionals joined in Paris with a common goal – to restore the pride in culinary excellence which had been lost during a period of wartime shortages. In that year La Confrèrie de la Chaîne des Rôtisseurs was officially incorporated, and the seal and coat of arms of the predecessor Guild were restored by Act of the French Government. Copyright © 2019 Chaîne Baillage de Reno - All rights reserved.